New publication by Michael Hameleers in International Journal of Public Opinion Research, titled: ‘Partisan Media, Polarized Audiences? A Qualitative Analysis of Online Political News and Responses in the United States, U.K., and The Netherlands’. Click here for the article. 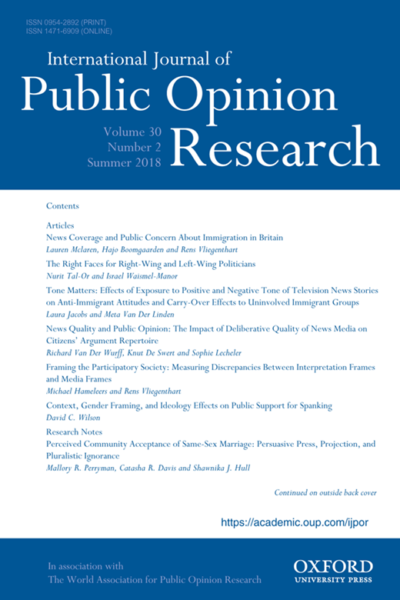 Abstract: Media outlets in the United States are frequently accused of articulating partisan biases in political reporting. In Europe, the media and citizens are assumed to interpret reality from polarized and populist mindsets. To date, however, empirical research has not explored how such interpretations are constructed online. Important questions remain unanswered: How are online media constructing partisan biases? How do citizens respond to such news? To answer these questions, this article draws on a comparative qualitative content analysis of online political news and responses in the United States, U.K., and The Netherlands (N = 1,179). Results reveal that citizens respond to partisan news with congruent polarized interpretations. These findings provide important foundational evidence for the congruence between partisan media and polarized interpretations.